I was a bit under the weather, and so wanted something warm, close, and restorative. They say that Thai Tom Yum soup does wonders for a cold, so I decided to hit up Thai Ramen Tinun, just around the corner from home. 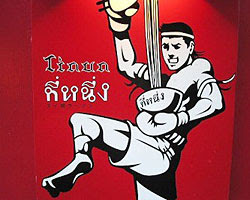 Although they offer a small menu of Thai dishes, Tinun is definitely a ramen shop (albeit a fusion-y one), with big vats of boiling soup and fat (EXTREMELY fat in this case) dudes slinging noodles in nets to shake the water off behind the counter. There seemed to be a mix of Thai and Japanese staff. Tinun seems to be a mini-chain, and the vibe was basically corporate chain ramen / convenient lunch place, with a few Thai knickknacks and posters around for decoration. The lunch special was truly a killer deal, with a bowl of Tom Yum ramen and a side of green curry and rice for around 800 yen (plus a student discount of an additional 100 yen off). The curry came first and was great - a couple veggies in a medium thick green gravy that tasted not unlike green curries I'd eaten in Thailand. For the ramen, you get the choice between standard Tom Yum or Nom Plaa, fermented fish sauce described on the menu rather euphemistically as "Thai Soy Sauce" though I'm sure they tone it down a bit for the Japanese palette. For the noodles, there is an option of "Chinese style noodles" (medium-thin standard "ramen" style yellow noodles) or varying thicknesses of white rice noodles. 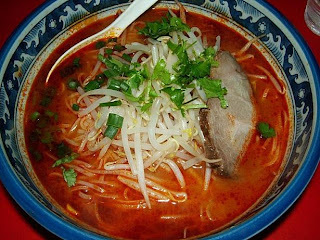 As tempting as Southeast Asian-style rice noodles sounded, I had to go with the Chinese-style or else it would just be Tom Yum soup, not ramen. Unfortunately, the bowl was a bit of a disappointment. The soup tasted a bit thin and weak and just didn't have all the flavor that good Tom Yum should. The noodles were fine, and the garnishes of cilantro were nice (most people in Japan absolutely hate the stuff, so you rarely see it), but cilantro alone does not a good soup make. Tinun's ramen was pretty disappointing, so I don't think I'll be coming back for it again, but I'll probably hit them up for dinner sometime to get some tasty curry and other Thai dishes.